The family-run, North Berkeley restaurant serves excellent dumplings, hand-pulled noodles, and blood sausage. 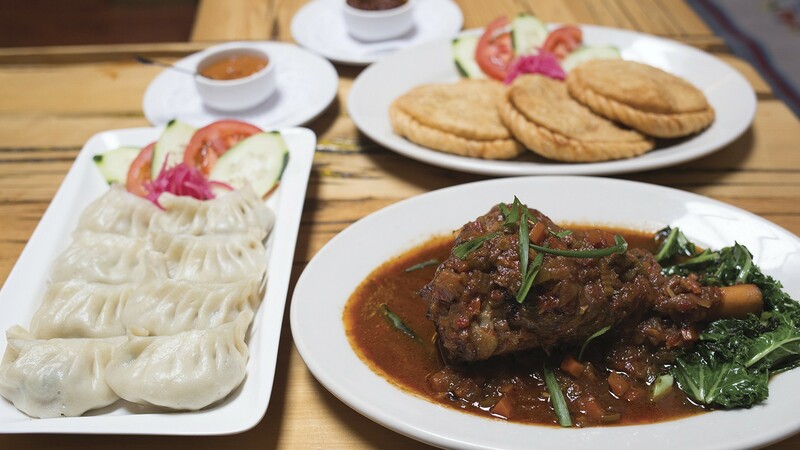 Traditional Tibetan specialties such as beef momos and empanada-like shabhaleys share the menu with unique creations like braised lamb shank with wok-charred kale. Jamyang Gyalkha fled Tibet as a teenager, trekking through the mountains. "A lot of hardships," recounted his wife, Tsering Lhatso. Eventually, Gyalkha landed in Berkeley, peeling potatoes and doing other prep work at the upscale restaurant Downtown, which is now Revival Bar + Kitchen. There, he rose the ranks in the kitchen and met Lhatso, who was bussing tables at the time. After years of bouncing between restaurants, Gyalkha finally got the opportunity to open his own place, Nomad Tibetan, in 2013. According to Lhatso, the landlord specifically wanted a Tibetan tenant for that Solano Avenue space, located a couple of blocks from the Albany border. That was extremely fortunate for both Gyalkha and the general public. Nomad Tibetan is just one of two Tibetan restaurants in the inner East Bay. While momos, the Tibetan steamed dumplings, have made their way to lots of Indian and Nepalese menus, it's nearly impossible to find other Tibetan specialties, such as gyuma, the blood sausage, and ting-mo, the twisted steamed bun. Even though Tibet is right next to China's Sichuan province, its cuisine is more influenced by its neighbors India and Nepal. Unlike Sichuan food, which is known for its unapologetic blasts of fire, Tibetan food is quite mild. As Lhatso explained it, the ingredients taste like the ingredients without too much adornment. It's meat-heavy, with an emphasis on goat, yak, and mutton. Since those meats are harder to procure in the United States, domestic Tibetan restaurants tend to rely on beef and lamb as substitutions. Breads, noodles, and dumplings are more common than rice, with barley being the staple grain. 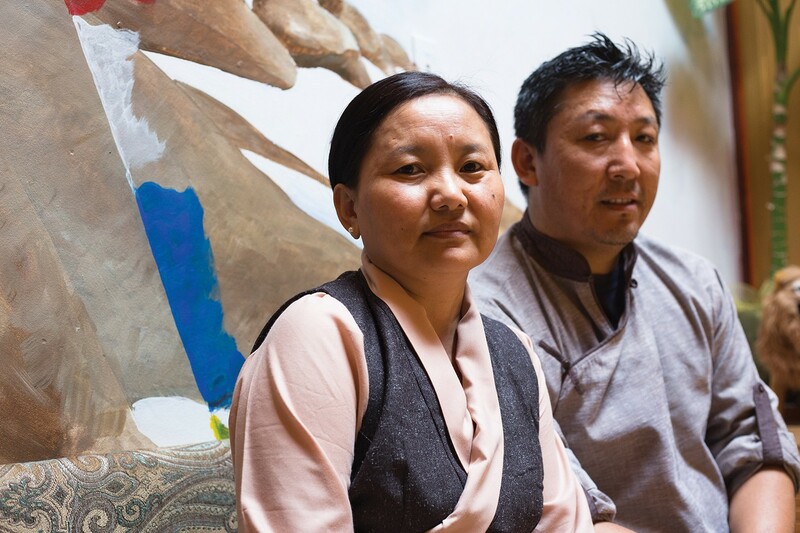 At the end of 2016, Gyalkha's former business partner left, and Gyalkha and Lhatso officially took over Nomad Tibetan as a husband-wife team. Gyalkha leads the kitchen while Lhatso runs the front of the house. It's totally a family operation. Lhatso's brother coined the restaurant's slogan, "traditional Tibetan cuisine with a modern twist," which Lhatso admitted might not be exactly accurate. Gyalkha takes advantage of his freedom in the kitchen, incorporating techniques he learned in American and Italian restaurants, but about half of his menu is traditional Tibetan fare. The rest is just what Gyalkha likes to cook, including some more generic Chinese dishes like beef with broccoli. "Everybody is making everything," Lhatso said. "Momos are so popular in India now. Nowadays, everything is mishmash." At Nomad Tibetan, momos grace just about every diner's table, and you'd surely regret not doing the same. They're wrapped by hand, delicate but not flimsy, and come with a delicious mild curry sauce for dipping. For the beef versions, Gyalkha grinds the meat himself to ensure freshness. The scallion-flecked filling was soft and aromatic, with each bite unleashing a flood of juice. I also thoroughly enjoyed a vegetarian version stuffed with lightly curried potatoes and onions — sturdier and more luxurious than the usual veggie dumpling options made with wilted greens. That same momo beef filling goes into the shabhaley, deep-fried meat pies similar to empanadas. Like the momos, these flat, crispy circles also burst with hot juice and felt like the definition of Tibetan comfort food. Three come with an order, making them ideal for sharing. Another Tibetan specialty is gyuma, a stark black sausage you can order steamed or pan-fried. I liked it slightly crisped up on the edges, which didn't take away from its chunks of tender beef within. Roasted barley flour provided bulk and mellowed the cow's blood flavor a bit. Husband-and-wife team Tsering Lhatso and Jamyang Gyalkha. On the milder side of things, Nomad Tibetan also serves some simple soups, including one consisting of smaller momos swimming in chicken broth and another starring hand-pulled noodles. Listed on the menu as thaen-thuk, the noodles are stretched into delightfully chewy, irregular pieces. I ordered it with lamb and enjoyed the gamey flavor it imparted on the soup, though the lamb pieces themselves were slightly tough. One of Nomad Tibetan's most popular dishes is the lamb shank. Braised in red wine, it arrived falling off the bone and covered in a thick, tomato-and-onion sauce. While there is a good deal of lamb in contemporary Tibetan cuisine, this preparation is Gyalkha's own creation — particularly the pairing of wok-charred kale. Kale appears in a few places at Nomad Tibetan, including as a bed for poached salmon. Unfortunately, it was the one dish I disliked, mostly because the salmon was overcooked, dry, and under-seasoned. It couldn't be saved by anything, even the accompanying browned butter sauce, something Gyalkha picked up from his days as a line cook. I did enjoy the side of fried taro cake, though, which reminded me of the crispy mashed potato puffs at Grégoire. You can also order it as an appetizer. Another Gyalkha original: the Shambala curry. Lhatso explained that there's no such curry in Tibetan cuisine, rather, Gyalkha is really good at preparing Indian dishes. This pink curry is more of an Indian-Thai hybrid with its use of sweet coconut milk, and I appreciated its bounty of mixed vegetables and tender, just-cooked chicken. You can also order it vegetarian, and Nomad Tibetan's menu is full of vegetarian options, although they usually lean Americanized Chinese in flavor profile. With all of Nomad Tibetan's dishes, I recommend liberally applying the chili sauce that sits on every table. The food is all prepared to mild spice levels, and while it doesn't need flavor boosting, the chili sauce is too exceptional not to try. It's a deep red color, chunky from blended garlic, ginger, tomatoes, onions, and a secret ingredient Lhatso would not reveal. I am not the first person to tell Lhatso to bottle and sell it. From the humble way Lhatso talks about her restaurant, you might expect Nomad Tibetan to be a no-frills hole-in-the-wall, but it's actually a spacious, comfortable spot warmed by wood-paneled walls and a burnt-orange ceiling. Tibetan prayer flags bleed into painted versions in a colorful landscape mural that stretches across the back of the restaurant. Walking along Solano, you'll easily spot Nomad Tibetan from the little stuffed yaks that decorate the windows.